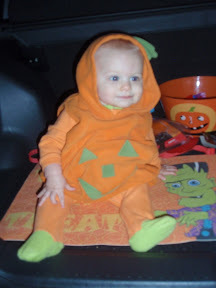 We started Tristan's first trick-or-treat at Memaw and Papaw's house. Memaw gave him a Tootsie Pop. He always grabs the bell off their coffee table and chews on it, but this time he picked it up and started ringing it without being shown how! 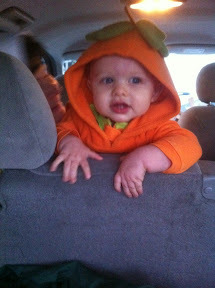 When we left their house we went to Trunk-or-Treat at church. That's where our members all pull into the parking lot with cars decorated and dish candy out of our trunks, or hatch in my case. 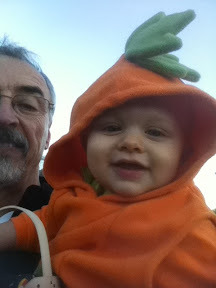 Tristan's top teeth are trying to come in and he had been in a bad mood all day. 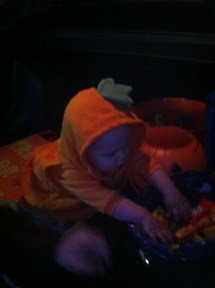 When kids started showing up in their costumes, though, he started to ham it up. We were joined by Mim, Papaw John, Granny, Suesue and my mom and dad. 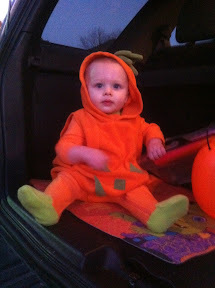 Everyone wanted to see the cutest pumpkin around. 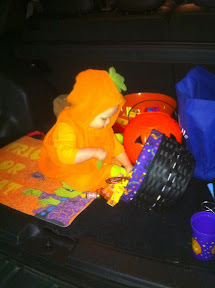 After I took him around to see his church friends, I let Tristan sit in the back of my truck. 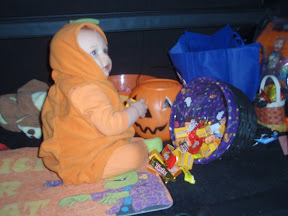 He started pulling candy out of my bucket and gnawing on the candy bars!